Looking for some new ideas for growing more food in your space? 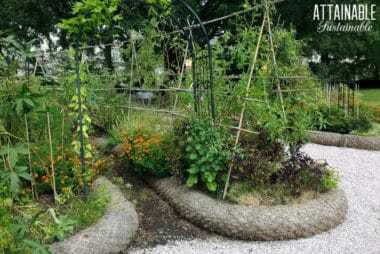 Consider a vegetable garden layout that includes sequential planting. 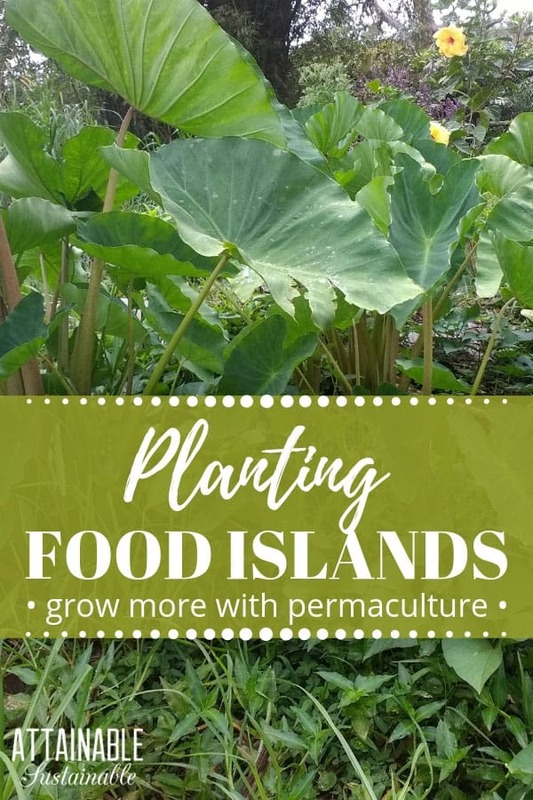 These permaculture design principles are especially effective with perennial vegetables. I recently had a chance to tour the Hawaii Institute of Pacific Agriculture, known locally as HIP Ag (which suits them better, I think — it’s a pretty casual place). These folks are doing amazing things with regard to food security, permaculture, and quite simply, educating people about growing food. Dash Kuhr is the lead guy at HIP Ag and he kindly shared his time with us to talk about what they’re doing. 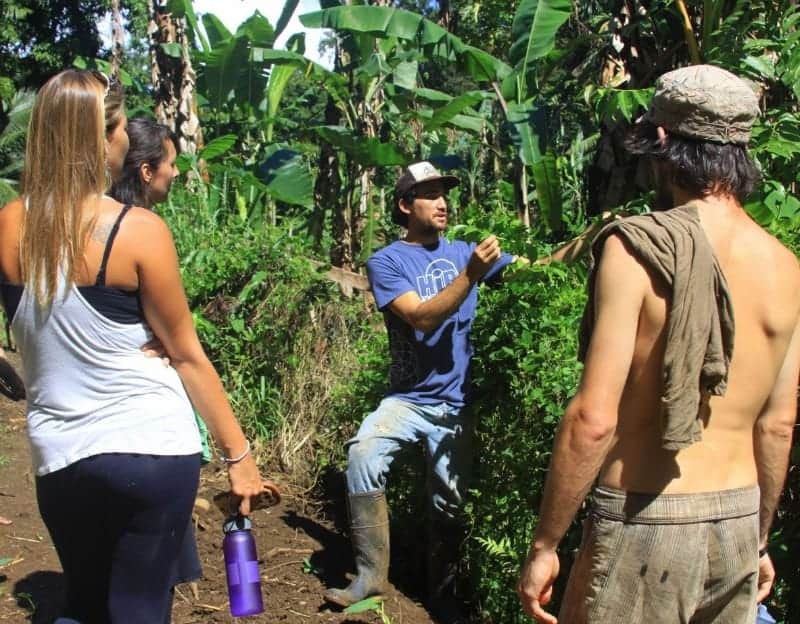 We primarily toured the permaculture areas of the farm, seeing their design principles in action. Since we’re working toward creating a food forest here on our property, this was such an inspiration. We tend to get overwhelmed with all of the ideas and possibilities, but visiting a site like this really helped us “see” what our place could look like. The HIP Ag property had lots of mature fruiting trees when they took it over, so they did have that base to work with, but they are implementing some great perennial/vegetable garden layout ideas for making their land more productive. They have a fairly large acreage to work with, but one tactic in particular could really work for small plots too. If you’re working on your vegetable garden design or a front yard garden that looks great, take note! My big permaculture design takeaway was the idea of sequential planting. While we’ve talked a lot about different garden ideas and making the most of our space by planting our beds with a variety of plants—low, mid-range, and tall—I hadn’t quite put my finger on the idea Dash expressed. They’re creating these sort of “food islands” that will produce edibles for them for years. They’ll typically start by planting one long-term crop. In one case, this was coconut; I think he said it would take six years to produce. But instead of planting a coconut tree and waiting six years for production, they plant the area surrounding it with plants that will begin to produce in a much shorter time period. Bananas produce in a year or two, making them a good choice for a vertical plant that will mature sooner than a coconut tree. By doing so, that area can become productive in just a season, while the long-term crop becomes established. Almost all of the vegetation at HIP is either a food crop or a crop that will benefit the soil. (Beneficial crops meaning either nitrogen fixing or a green manure crop that can be chopped for compost.) Now, I come from an apple farming background. An apple orchard is planted in rows. These permaculture design principles are so far from what I learned! Back in the day, my dad wouldn’t even let grass grow under the trees — he’d disc to turn the weeds under. And that orchard wouldn’t produce for years. Lots of time and effort went into it each year but the orchard wasn’t producing anything edible. Mind you, what you see here is the plan in action in a tropical climate, but think about the possibilities in your region. 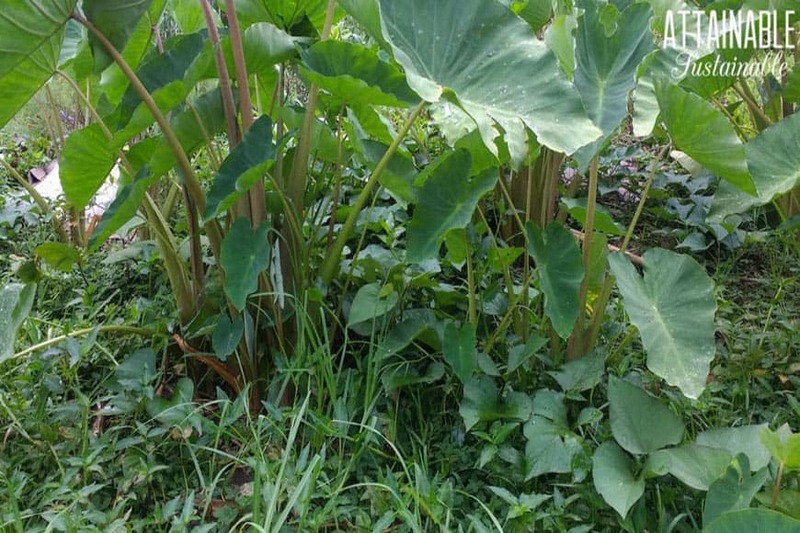 (Above: Sweet potatoes growing under kalo/taro in our yard.) What if instead of planting small orchards on a grid, we created a smarter vegetable garden layout, especially when planting perennials and fruit trees? Little food islands, if you will. Production farmers might balk at this idea, but for those of us who are primarily concerned about producing on a small scale for our own personal use, this method could really boost initial production. A fruit tree that won’t produce for years could become part of our vegetable garden design. A young fruit tree won’t throw much shade, so sunlight isn’t an issue for those first years. Plus, whatever you plant around your tree will help shade the soil and retain moisture around your tree. I’m thinking that you could use perennial vegetables like artichokes and asparagus as understory plants. Fruits like blueberries and strawberries would work well, too. Annuals like eggplant and peppers would work well. You could even plant perennials to attract bees. We’ve been utilizing some of these permaculture design principles at the edges of our property, but all is not perfect in paradise. It may take my husband some time to come around to these alternative garden ideas and planting other things in his orchard! Now, I’m fairly new to the idea of using permaculture design principles on a small scale, but my friend Amy is an expert. Amy’s book has just been re-released in a full-color version! All the same great information, but with full color photos. 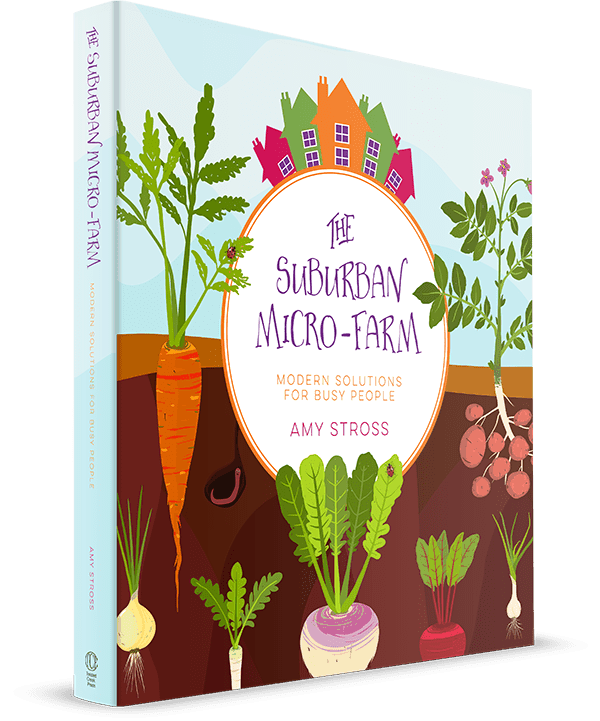 The book is divided into three sections: Getting to know the micro-farm; becoming a micro-farmer; and advanced micro-farming techniques. Amy tackles the idea of “food guilds” in the garden, using swales to retain water on-site, using materials generated on-site to limit inputs, and so much more. You can use permaculture techniques in an urban setting! It’s an excellent guide for transforming your space – large or small – into a productive one. You can read more about the book here. Top photo courtesy of Suzanne Bell. Kris, sometime back in 2010 I attended a workshop on this same subject – I wrote about it in The Hamakua Times – These island gardens make perfect sense for our yards and gardens! plant edible perennial flowers, daylilies, carnations, even miniature hollyhocks…. for a life time of beauty and food! I use barrels between my dwarf fruit trees. 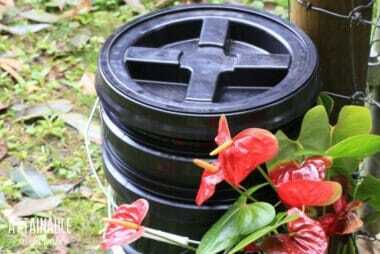 Our soil is clay and doesn’t drain, the barrels work great and can be moved as needed. I didn’t know this had a name. This is how we planted our apple trees and I built garden beds between them with asparagus and strawberries, and added hugekultur beds for annual vegetables and flowers. Our apple trees took 10 years before they started producing. We are a long way from being finished. I add a few new things every year with more and more emphasis on perennials. Now if only we could grow coconuts. Lucky YOU. Permaculture involves a lot more than just planting long an short term crops together (succession planting). 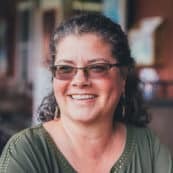 If you really want to understand more about peramculture gardening, I suggest listening to the *absolutely FREE* lectures (there’s about 70 lectures in all) at https://www.openpermaculture.com/ . This is such an amazing site. 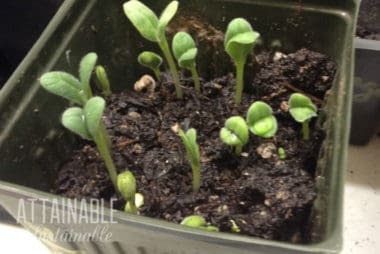 They taught me not only about guild planting (what you’re hinting at here in this article) and succession planting, but also herb spirals, garden design principles, water conservation and gather techniques, soil building (using plants and animals to fix the soil), forest gardening, how to build and sustain water cultures, and how to use animals in maintaining the miniecosystem you build. There are other resources that help you with what to plant in your guilds (groups of interconnected plants that are beneficial to each other) in books such as Gia’s Garden; Toby Hemenway has many charts of companion planting plants that fulfill the needs of a guild (suppressors, attractors, repelers, mulchers, accumulators, fixers) like those listed here: https://www.openpermaculture.com/magazine/seven-parts-apple-tree-guild. Hope this helps. I highly suggest watching on You tube – Miracle Farms, a 5-acre commercial permaculture orchard in Southern Quebec, Canada – wonderful insights that will work in non-commercial situations both large and small applications.